Star Wars fever is most certainly sweeping the nation, with Star Wars: The Force Awakens shattering box office records left and right through its first two weekends in theaters. Star Wars: The Force Awakens is set 32 years after Star Wars: Episode VI - Return of the Jedi, reuniting fans with franchise favorites Luke Skywalker (Mark Hamill), Han Solo (Harrison Ford) and Leia Organa (Carrie Fisher). But, of course, not every character and/or creature could feasibly come back for this new adventure. If a theory by Tech Insider is true, there's a very good reason why the beloved Ewoks weren't included in this new movie: They are all dead. There has already been speculation that the destructive power of the Starkiller Base may have wiped out the Ewoks' home planet of Endor, but if this new theory is true, the tiny creatures may have been wiped out shortly after the events of Return of the Jedi. As you may recall, the Rebel Alliance had to destroy the second Death Star's shield generator, located on the lush planet of Endor, before they could begin their attack on the Death Star. According to Dave Minton, a planetary scientist at Purdue University and longtime Star Wars, the destruction of the Death Star would have also triggered an "Endor holocaust." Here's part of his "white paper" theory below. "I have to assume that the Death Star is being maintained in its position using something like [anti-gravity] repulsorlifts. [M]ore or less what happens after the destruction is that the entire mass of the Death Star simply falls onto the location of the shield generator. A Death Star-mass ball of fragments will leave behind a 700 km diameter crater. This is almost 4 times larger than the Chicxulub crater in Mexico that is associated with the dinosaur extinction. The aftermath of this impact would be to obliterate everything on the surface. No Ewok could withstand an impact of that magnitude. It is likely that the atmosphere would be so heated up ... that every body of water on the entire world would be flash heated to steam, and every forest would ignite into a global firestorm." Of course, the very end of Star Wars: Episode VI - Return of the Jedi, the Ewoks are seen reveling in celebration with the Rebel Alliance heroes as the original trilogy came to a close. The Ewoks' fate after the movie has never been officially addressed, but Dave Minton isn't the first scientist to theorize about the Ewoks' demise. Back in 1997, astrophysicist Curtis Saxton wrote a 10,000-word essay for TheForce.net claiming that Endor's destruction was "inevitable." However, his measurements were often open to interpretation and other details weren't consistent. This lead to Tech Insider consulting with 11 different scientists, including Dave Minton, who came to the same conclusion. You can take a look at Dave Minton's full essay below, which is based on a graphic of the Death Star and Endor shown in Star Wars: Episode VI - Return of the Jedi. 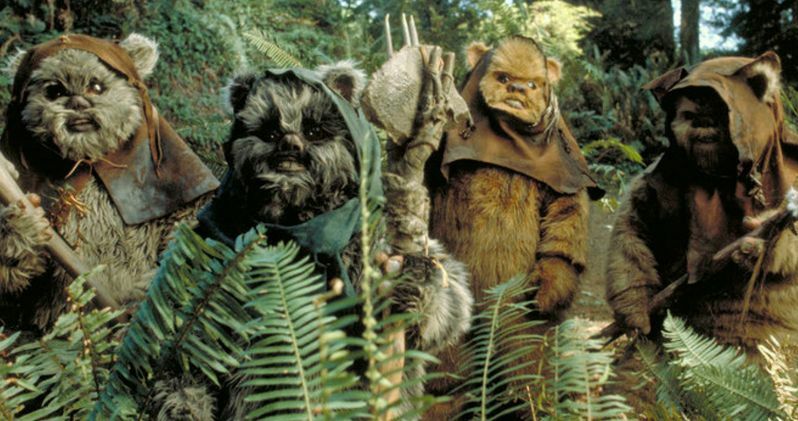 We may never officially know what actually happened to the Ewoks in the Star Wars franchise, but this theory provides some very interesting food for thought. Do you think the Ewoks were destroyed in the aftermath of Star Wars: Episode VI - Return of the Jedi? Let us know what you think below and stay tuned for more on the Star Wars franchise as a whole.